Indentification of this design as number 105 is original to Rakusan who designated this woodblock print as the 105th design published in his main sequence. However, 105 is actually the fifth of thirty-six woodblock prints in Rakusan's second main sequence series, 篁子生画選, Koushisei Gasen, lit. 'Koushisei's Print Selection' (usually called here the 36 Series). The woodblock print of 105 was adapted from an actual-size original painting on silk created in early to mid 1933. All of the original prototype paintings for this series are currently in a single private collection. 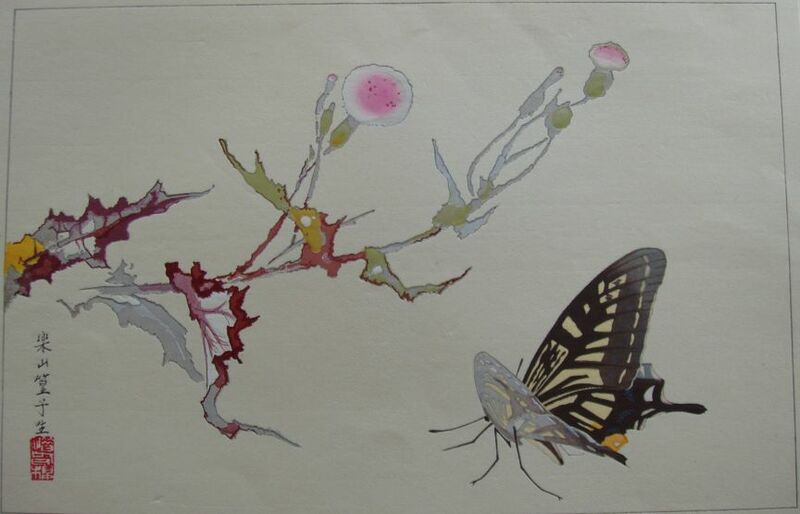 Both the original painting 105-0 and the woodblock print 105 show the swallowtail butterfly in exactly the same pose. However, in the painting the butterfly casts a small shadow which makes it seem to be sitting on a sheet of white paper. In the woodblock print 105 the shadow is omitted and the same butterfly therefore appears to be in flight. Like most 36 Series designs 105 has the same signature and seal combination on every copy. Therefore, for 105 only a single extended edition I (which includes reprintings both before and after World War II) can be distinguished. It is usually only possible to date an individual loose print of 105 with edition I markings by listing approximate potential ranges of 1933-1941 and 1948-1955. The copy illustrated above is typical of edition I. The Rakusan project which produced 篁子生画選, Koushisei Gasen, resulted in two related series of woodblock prints. Each print of the 36 Series is intimately connected to a group of prints with the same subjects in the Fan Series. Together these subject-related prints in the two series constitute a theme. Each theme consists of a quintet of monochrome Fan Series designs (one design in each of the five fan shapes), plus one polychrome, 36 Series design which illustrates the theme subject. The theme is labeled here by the original Rakusan number of its 36 Series design followed by the subject. 105 is the 36 Series design of the 105 Butterfly theme. The 105 Butterfly theme is one of the many entirely regular themes represented by a complete fan quintet and a color woodblock print. The 36 Series design 105 and all five Fan Series designs have seal A which indicates carving dates around the third quarter of 1933. It was during this period that Rakusan was making his initial plans for the two series. He created and carved all of the designs in the first six themes (including those of the 105 Butterfly theme) plus a scattering of other designs weeks or even months before publication of the series was to begin. Publication of the Fan Series and the 36 Series began in January 1934 with installment one containing the first three themes (101, 102, 103). The Fan Series delivery documents for installment one announce that butterfly designs would be published the following month, February 1934, in installment two (of twelve). The prints in both series were printed in the same month they were published. Between installment one in January 1934 and installment four in June 1934, Rakusan skipped two monthly deliveries while he sorted out the remaining themes in both series. Because the delivery documents for installment two remain to be discovered, it is technically possible that installment two (containing themes 104, 105, 106) could have been published in February, March, or April 1934. However, the wooden blocks for printing the designs in installment two had already been carved, and there seems no reason why installment two would not have appeared as advertised in February 1934. Other evidence suggests that the two-month break was a single block between installment two and installment three during which major changes occurred in markings and organization. On the delivery documents Rakusan used the theme title 揚, chou, 'butterfly', which was also the original title of the 36 Series design 105. Butterflies and other insects often occur as subsidiary elements in Rakusan designs. However, in all of the other themes where they appear, those themes are defined by kinds of plants. The 105 Butterfly theme uniquely reverses the focus; its theme subject is defined instead by a kind of insect, and the plants are non-thematic subsidiary elements. Since 105-5 includes only butterflies, it is evident that the butterfly alone defines the 105 Butterfly theme since it is the only element common to all of its designs. At least some of the designs in this theme were reportedly adapted from sketches originally created in the late 1920s during the planning of the earlier 100 Series. In Japanese the general name for butterfly is 蝶, ちょう, チョウ, chou, which applies to all the butterfly species illustrated in Rakusan's works and is optionally added at the end of butterfly names. Asian Swallowtail (Chinese Yellow Swallowtail), Papilio xuthus, (並)揚羽, (なみ)あげは, (ナミ)アゲハ, (nami-)ageha, '(common) swallowtail', is a native species in Japan. Rakusan used this species in 105, 105-1, and 105-3 in this theme; as well as in a rose design, 101-3B, (where it is non-thematic). Spiny Sowthistle, Sonchus oleraceus, 野芥子, のげし, ノゲシ, no-geshi, is a common native weed. It is used in 105 and in 105-2 (with a different kind of butterfly) in this theme; as well as in a river crab design, 131-2. In all of these examples it is a non-thematic subsidiary element.